SelectHub, a technology selection management (TSM) software company, today released their year-end update for their CRM Software Leaderboard– showcasing the top CRM systems ranked across more than twenty key requirements. Twelve CRM systems stood out from a group of 80 top contenders to gain a spot on the SelectHub Leaderboard—highlighting their ability to meet the most important criteria identified by organizations seeking CRM software. Popular platforms like Infor CRM, Salesforce Sales Cloud, SugarCRM and Oracle Siebel are featured alongside other highly rated solutions like Nimble CRM, Microsoft Dynamics CRM and Pega CRM. 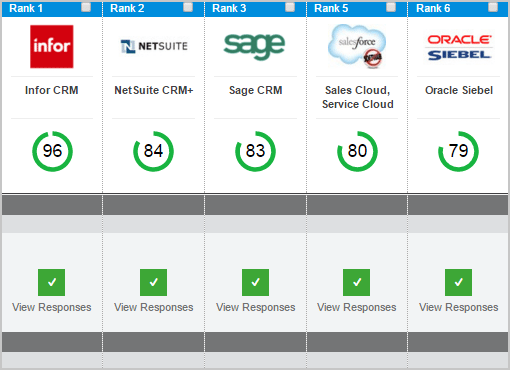 Key ranking criteria for the Leaderboard includes such functions as customer targeting, email marketing and opportunity management—where Infor CRM, NetSuite CRM+ and Sage CRM achieved top scores—to reporting and analytics where solutions such as Mothernode CRM, SAP CRM, Infusionsoft CRM and Salesforce are among the leaders. Complete CRM Leaderboard results are available free with registration. SelectHub Leaderboards pair up the most important criteria for technology selections alongside vendor competencies and product capabilities. SelectHub calculates the ratings for CRM platforms across twenty functional and business categories, using data sourced from over one thousand software selection projects and RFPs managed through their technology selection management platform. SelectHub then corroborates vendor scores with independent industry and research experts to verify and ensure the accuracy of the CRM ranking methodology and findings. An interactive leaderboard is available as part of SelectHub’s software selection platform and can be customized based on users’ specific CRM requirements. Users can initiate RFIs and RFPs with short-listed CRM vendors as well as access leaderboards for popular adjacent software categories such as enterprise resource planning (ERP), marketing automation and business intelligence (BI). SelectHub is a cloud-based technology selection management (TSM) software platform helping streamline software selection and IT sourcing to be more agile and collaborative. The platform supports a comprehensive set of evaluation stages from requirements gathering to vendor shortlisting, demos and user trials, RFI/RFPs and contract negotiation. SelectHub customers include Hunter Douglas, Advanced Energy, QEP Resources and the State of Colorado. To learn more, please visit http://selecthub.com.